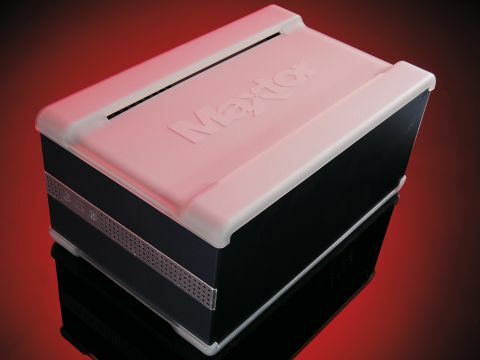 Unlike most rivals and even smaller-capacity versions of the Maxtor Shared Storage II, this 1TB model comes complete with two built-in hard drives. In spite of this, it's compact and extremely quiet in operation, getting off to an impressive start. Even though Seagate acquired Maxtor a while ago, this drive still carries the Maxtor logo with pride and comes with good supporting software that's typical of the name. The big idea about having two 500GB drives, apart from offering a whole terabyte of storage, is that you can set up automatic mirroring between the hard drives. This is great news for doubling up on your most precious data, especially as the Maxtor does all the copying so invisibly and efficiently behind the scenes. The installation goes the extra mile and installs the drive on the network in such a way that it appears with a proper drive letter, like local drives, rather than relying on the use of My Network Places. Easy disk management is matched by a powerful back-up utility that also comes with the drive. This works in conjunction with the two USB2 ports on the drive's back panel, which you can use for sharing printers as well as for attaching extra external drives. After all, even though you've got two hard drives built in, it still pays to have an independent back-up source to protect against fi re or theft. Based on fast, 7,200RMP SATA II hard drives and Gigabit Ethernet, the Maxtor is certainly no slouch when it comes to performance, proving a match for any Gigabit-standard drive. Sure, it's expensive, but if you're after top performance and the belt and braces approach of two drives rather than one, the Maxtor II fits the bill perfectly.